Man, watching Patrick Mahomes in 2018 was cool. So now, entering the 2019 season, you could make the argument the Chiefs have the best fantasy quarterback in Mahomes and the best fantasy tight end in Travis Kelce. Tyreek Hill probably isn’t the best fantasy wide receiver, but if you started making a list, it wouldn’t take you long to get to him. Sammy Watkins might never have developed into the superstar receiver he looked like he might be early in his career, but he’s got plenty of talent. 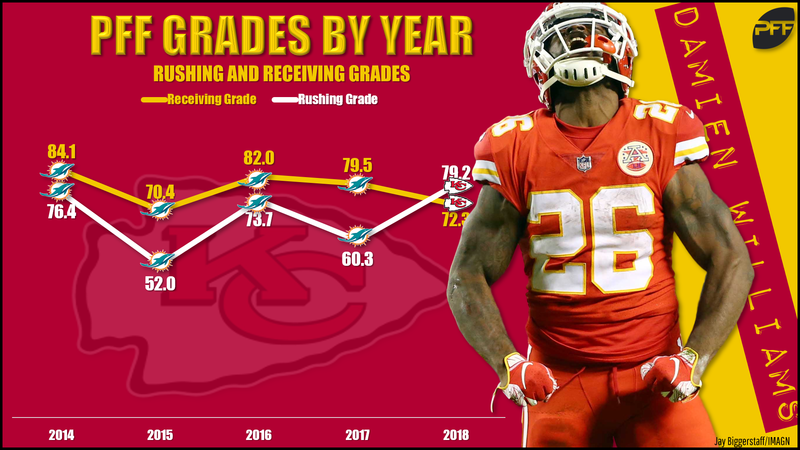 Damien Williams, taking over the running back role late in the season, averaged nearly 25 PPR points per game from Week 16 through the playoffs, an obviously unsustainable pace that would have nonetheless made the top fantasy running back over the full season. And the Chiefs are still in the top half of the league in available cap space. In short, the Chiefs don’t need much on offense (the defense is another story). But that’s not to say there aren’t moves we could get behind. Williams was a revelation down the stretch. He totaled 297 rushing yards after Kareem Hunt’s release (postseason included) after under 500 rushing yards in his career (2014-present) before that. His six rushing touchdowns in that span was double his career total. In limited playing time, he’s graded out better as a receiver every year of his career before 2018. In short, Williams has been a fun story, but counting on him as a bell cow could be dicey. Enter Ingram, hitting free agency after eight years in New Orleans. He had the No. 10 PFF rushing grade (81.4) in 2018 and has averaged better than 3.0 yards after contact per attempt cumulatively over the last three years. Ingram as the lead back with Williams as a third-down/change-of-pace option offers more fantasy upside than Williams as the No. 1 and a cast of thousands behind him. He’ll still be around thanks to the late-season extension, but Ingram would be a more fun option for fantasy purposes. The Broncos’ 29-year-old center has been an elite run-blocker for a big chunk of his career. He’s never graded below 74.0 over a full season, including a peak of 90.2 in 2016. He’s coming off a broken fibula that ended his season in Week 9, but still has a high ceiling. Kansas City’s primary 2018 center, Mitch Morse, was a strong pass-blocker but struggled blocking the run and is entering free agency himself. Only 2 years younger than Paradis, he’s not so important to the Chiefs that they should feel obligated to keep him around. Assuming Paradis’ leg is healed, better to move to the ex-Bronco. Chris Conley, De’Anthony Thomas, and (for whatever it’s worth) Kelvin Benjamin are all hitting free agency, so as good as Hill is, and as good as Watkins should be, the Chiefs aren’t exactly miles deep at the receiver position. They might not want to spend a first-rounder on the position, given the team’s need on defense, but it’s worth tossing a Day 2 or 3 pick at a receiver or two who can hopefully develop into the team’s next weapon.